The bright colors of the pink ombre cake give the cake the perfect spring or summer vibe. And those ruffles of icing? Gorgeous! 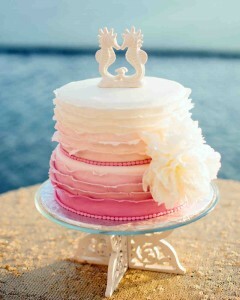 The kissing seahorses on top of the cake are the perfect warm-weather cake topper! Add in a bright white bloom as an accent and you have the perfect beach-themed wedding cake. A cake like this will make you forget it’s winter! You can find this wedding cake here. It was created by Cabo Flowers and Cakes.